Accurately measured logs are decked cleanly, evenly and accessibly. The snow is plowed well out of the way, allowing good visibility and safe access for men and equipment working on the logging show. And there’s no clutter or logging debris littered around the site. Trying to maintain a clean working environment is by design for logger Gregory Jacob and his crews. It’s a key to helping the operation run smoothly and efficiently, explains Jacob. Identifying and practicing ways to making the logging show function efficiently these days has never been more important or necessary. Jacob is president of Lo-Bar Log Transport, a full phase log harvesting contractor based in Prince George, British Columbia. Lo-Bar originated, as the full name suggests, as a log hauling company in Alberta and Jacob saw no reason to change the company name and tradition when setting up shop in B.C. He began his logging career in 1980 and from 1988 to 2005 was a stump-to-dump contractor for Weyerhaeuser in Drayton Valley, Alberta, eventually harvesting around 300,000 cubic metres annually. 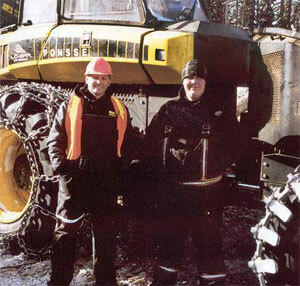 Gregory Jacob (left, in photo) president of Lo-Bar Log Transport, with mechanic Curt Donaldson, with part of Lo-Bar’s fleet of Ponsse harvesters and forwarders. The outfit runs five of the Finnish-made harvesters and two forwarders. Times since then have been traumatic for the forest industry. “We’ve grown and prospered, not that it’s been easy. But Canfor has allowed us to grow.” Lo-Bar is presently contracted to harvest 450,000 cubic metres annually. A stronger-than-anticipated development of the Chinese market for B.C. 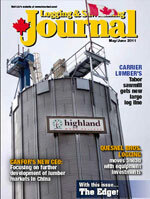 wood products is playing its role in boosting the optimism factor. Jacob gives Pat Bell, former B.C. forests minister and still the MLA for Prince George-Mackenzie, credit for his part in promoting the industry’s interests in China. “He’s done a tremendous job with his vision and drive in China and becoming a partner with industry,” says Jacob. When the Logging and Sawmilling Journal visited, one of Jacob’s logging sides was being allocated to helping out sister mill Canfor Quesnel with wood. A principal reason for re-opening the Quesnel sawmill after its U.S. market-enforced closure was to produce lumber for Chinese markets. Jacob’s wood specifications for Quesnel were straightforward: lodgepole pine up to 15 inches in diameter and 13 foot four inches long. Spruce and larger pine were prepared to Canfor Prince George sawmill’s specifications. Lo-Bar operates northwest of Prince George and is a regular fibre supplier to Canfor Polar in Bear Lake. 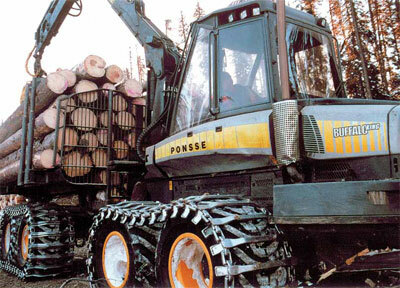 Key machines to produce logs specified by Canfor are Jacob’s fleet of Ponsse harvesters and forwarders. He runs five of the Finnish-made harvesters and two forwarders, complemented by three Valmet and a John Deere machine. His ‘other’ side has a more typical machine alignment for the region including a Tigercat feller buncher and Waratah harvesting heads. Lo-Bar also operates three John Deere log loaders and has 18 of its own logging trucks. “We started out as a log hauling company so we’ve always had trucks. We ran up to 20 in Alberta and had 10 when we came to B.C.,” says Jacob. The Ponsse component of the equipment fleet is much more recent, beginning around 2008. The Ponsse machines were purchased from Woodland Equipment Inc., one of western Canada’s leading heavy equipment dealers for the forestry and construction industries. Woodland Equipment is the Ponsse dealer for Western Canada. Ponsse harvesters and forwarders are used in forests around the world and have been common for years in the Maritimes and parts of Ontario and Quebec. But Jacob's fleet is the first in B.C. and the west. Ask him why he chose to run the Ponsse's and the response is quick and direct. "In a word, efficiency," says Jacob. "They appeal to me because they produce wood at a lower cost per cubic metre than the system we were using," he explains. 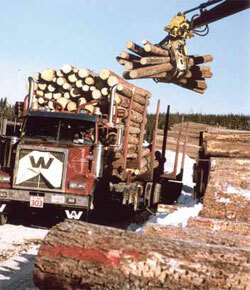 During a recent visit to the operation, one of Lo-Bar’s logging sides was supplying Canfor’s Quesnel sawmill with wood. Their wood specifications for Quesnel were straightforward: lodgepole pine up to 15 inches in diameter and 13 foot four inches long. Fuel is a compelling factor. The Ponsse machines are significantly more fuel efficient than other harvesting equipment and fuel costs will only continue to rise, he points out. functions. By the end of the day, there’ll be just as much wood down on the ground and it will have been easier on the operator and the machine. Jacob doesn’t have hard and fast rules about when a piece of forestry equipment should be considered for replacement. Each is different although all are subject to regular and rigorous preventive maintenance regimes. “Often, you don’t have much control of the revenue side of the business but you can control costs to varying degrees,” continues Jacob. That is one reason why Jacob’s crews perform most of the needed repairs on logging trucks and equipment in-house at the company’s recently expanded shop facility in a Prince George industrial area. Jacob notes the prolonged recession has had its effects on the loggers’ supply chain for new equipment. But that is changing as the industry in all its phases gathers momentum and Jacob anticipates manufacturers will soon be introducing more new logging machines and equipment into the marketplace. “For the contractor, you have to try and stay ahead of the technology curve and keep improving,” he says.